An iPhone, car keys, ticket stubs, a messy cup of coffee. These items litter the top of the desk in GeekWithLaptop’s Desk Mess WordPress theme. Lots of tape on this one, tacking scraps of paper for each navigation link up top, and the search bar onto the right sidebar of the main content area which, surprise! looks like a notebook. It’s fixed width, two columns, xHTML valid, has widget support, and has gravatar support, and Desk Mess is released under GPL license. In spite of the uninspiring name, The Book WordPress theme is quite nice looking, being a simple open spiral notebook with aged paper and a few photos at the top. The theme’s nice headline typography sets it apart. The Book is 2 column, fixed width, and widget ready with a right sidebar. 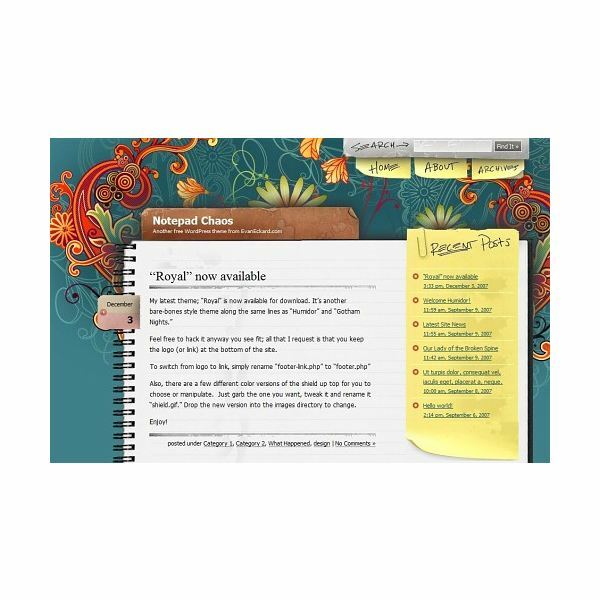 Released by Smashing Magazine, Notepad Chaos looks like a well-used spiral notebook. It has a bit of worn cardboard sticking out the top where your blog title goes and little tabs sticking off the side for post dates. The sidebar delineates recent posts and categories with a paperclipped yellow note for one and a thumbtacked scrap of ruled paper for the other. The whole shebang sits atop a colorful, yet unobtrusive paisley background. As an added bonus, not only is the theme free, the designer, Evan Eckard, has also provided a layered PSD (Photoshop) file of the design mockup! It’s free to alter any way you like; just keep the link back in the footer. The Art Crib WordPress theme isn’t on a desk anymore: the notepaper, travel photos, and inexplicably, cash and an open, messy pain can, are scattered on a hardwood floor. This is what happens when you let all of that work pile up! 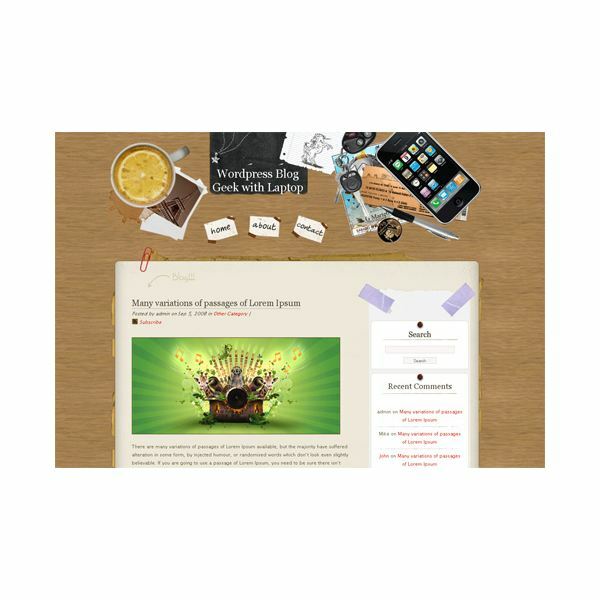 The theme has three columns and supports widgets and adsense and works in the major browsers. 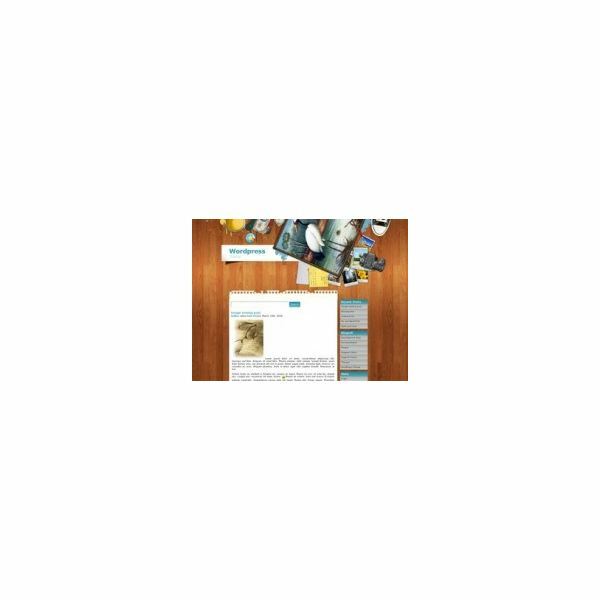 Blogger Notes by Padd IT Solutions is a spiral notebook-look WordPress theme with a warm yellow feeling, and set on a colorful background. The body of the theme looks like a notebook with two pages. The main page holds the blog posts and the smaller page is for the RSS feed, categories, etc. EZwpthemes’ Traveling Logbook looks like your desk might look after you’ve returned from an exotic trip abroad, and you’ve laid out some snapshots and mementos — seashells, anyone? — and cracked open your travel journal to reminisce. The colorful theme is designed for WordPress 2.7, but will work on older versions. It has two fixed colums and a left sidebar. Find the perfect, free WordPress theme for your blog. Each article rounds up several awesome themes based on category. Sometimes it’s subject matter, like a food blog, and other times it’s by look, like funky, realistic themes that mimic a desktop. Take a look and find one you love!